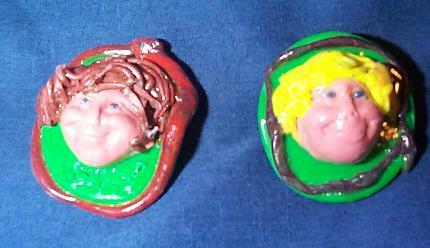 Chadis Crafts's Fun Pages- Polymer Clay Face Pins. Polymer clay (in this case Sculpey ) can easily be made into face pins. Even the smallest child with a little help can make them. Pins can be made to look like the child or into Santa , Pirate, What EVER! See Clay pages to see basic polymer clay lessons for: softening handling of clay, and setting up the work area. Sculpey clay or left over Sculpey of about the size of a large egg. Most crafts stores and online craft companies have PUSH MOLDS with animals, faces etc. They can be used with polymer clay or Friendly Plastic. When using clay, dust mold lightly with baby powder. (too help the clay release from mold. (of course in their choice of colors of skin.) of about 2 inches . Push into mold and then gently take out. Extra clay can be cut off the edges of the project. A clay gun is used to make the spegetti strings for the hair. Additions colors of clay can be added for eyes and mouth. Take an additonal ball of clay and flatten for the base. A snake or multiple twisted snakes are placed around the edge of the pin for decorations. When done use a tooth pick or pointed object to carve their name or initials on the back making sure to leave room for pin to be glued. When cool, glue pin back on and let harden over night. I gloss after pin is glued to keep the finish unmarked. If turned over when not completely dried it can use marks!